"Install a carbon monoxide detector in your home today." installation and get 100 bucks! 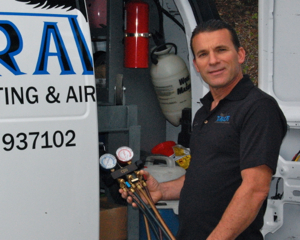 Raven Heating & Air Conditioning is a family owned business with over 25 years experience in the industry. We are proud to provide commercial, residential, and industrial heating, ventillation, air conditioning sales, service, and installations in the San Francisco Bay Area. Customer satisfaction is our number one priority. We believe this can only be accomplished by providing superior products, service, and competitive pricing to our customers. We strive to meet the needs of our customers in such a way that they are compelled to tell others about their experience. Give us a call and discover why everyone is "ravin' about Raven". Dave attended Universal Technical Institute in Phoenix, AZ. in 1985-86, where he was trained in the HVAC field. Dave returned back to the Bay Area with his wife, Brenda and have now been married for over 25 years, and have two adult daughters. Dave worked for a small shop in San Francisco for over 20 years, before starting Raven Heating & Air Conditioning, which was named after his late father's local business- Raven Electric. Dave is known for running his business with honesty and integrity and always taking pride in his work. ©2019 Raven Heating and Air. All Rights Reserved.